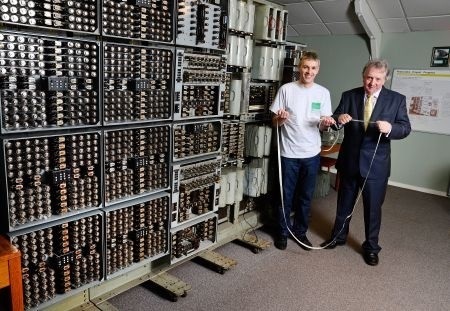 The main event of the last quarter was the ceremonial opening of the EDSAC gallery at TNMoC by Hermann Hauser on 26th November 2014, attended by nearly 50 volunteers and guests. With an appropriate coup de théâtre a projected image of the 1949 EDSAC was transformed into the reconstruction behind. Andrew Herbert gave a tour of the machine to the audience, Peter Linington demonstrated the nickel delay line store, Bill Purvis demonstrated the tape reader and teleprinter. Martin Campbell-Kelly gave an informative talk about programming EDSAC. Chris Burton ceremoniously switched EDSAC on and we were able to show the audience clock pulse, digit pulse and address selection signals from the commissioned chassis on a pair of oscilloscopes. Commissioning has been concerned with three main topics: clock pulse generation, coincidence and order decoding. John Sanderson has completed and added the clock and digit pulse distribution units. He and Peter Lawrence are currently investigating running the clock at the desired 520kHz. John Pratt has completed the counting and coincidence logic for the main store addressing system. This revealed some problems with noise susceptibility in our flip/flop design that has now been investigated by Chris Burton. John has tested the new design and reports his circuits as working satisfactorily. With this we passed an important milestone, seeing EDSAC count in binary! James Barr has started commissioning of the order decoding system, aided by Peter Haworth, beginning with unit testing of the individual chassis now mounted in their racks. Peter Haworth, Les Ferguy and Don Kesterton have completed the basic bench testing of the approximately 40 storage regeneration unit chassis at TNMoC. Nigel Bennée continues to develop the arithmetic unit and has the accumulator, adder and shifting units working at his home. Chris Burton continues to investigate the clock monitor unit and the “three oscilloscope” unit. Peter Linington is investigating long delay lines, chasing down sources of echoes that could lead to reliability problems. Bill Purvis set up a database with a web interface to retain project documentation. From the home page the user can navigate by rack to find specific chassis and call up logic diagrams, circuit schematics, CAD drawings, images of primary signals, engineering and maintenance notes, list of external signal interconnections, etc. At this point the database is only partially populated but the intention is that by the end of the project it will be the complete repository for a full technical description of the reconstruction and a guide to enable fault diagnosis and repair once complete. One of the commercial units in the EDSAC power supply has developed a fault and is to be returned under warranty for repair/replacement. Fundraising remains a priority. We are still about £46K short of our target of £250K. Through our website and PR activities we continue to generate interest in the project and unearth new things. Just before Christmas we took delivery of an original EDSAC chassis from a Mr Robert Little of Allentown, Pennsyvania, USA. The chassis is a “late model” storage regeneration unit, matching the drawing in the collection retrieved by John Loker. Mr Little says he acquired the chassis from Dr Robert Clark who had bought two or three EDSAC racks at auction with the intention of turning them into bookshelves. Some artefacts from Lyngby, Denmark, were delivered early January. The highlight is an IBM 091 “Hollerith Type III Tabulator” (right) which dates from 1921 and is in excellent condition. The shipment also contained two Executive typewriters. The 082 card sorter has been delivered from Greenock (below). The 024 card punch is now in full working order. It and its companion 056 verifier have been fitted with home-made table tops and rear covers. Work has also commenced on the 056. Mechanical cleaning, lubrication and adjustment is completed, but unfortunately we have noticed that one of the post-office type relays has been damaged and the armature is missing. We are on the lookout for a replacement. The covers of the 705 console (right) have now been straightened. We have designed a machine identification plate in Photoshop and are printing, laminating and fitting to the console. The photograph shows the prototype plate. We have also designed a 3D model of a missing key top and ordered a 3D print to fill the gap. In Resurrection 65 I reported, “The replica continues to be routinely operated and demonstrated at MOSI, on four days per week including Sundays. The volunteers use as a measure of public interest the number of conversations they have with visitors in a session, and typically this number is in the range 20 to 40”. A year on and I can report the same, with the exception that visitor numbers and interest seem, if anything, to be greater. Brian Mulholland, the volunteers’ leader, comments on the enthusiasm of the team. Two members are at Level 4 status – allowed to diagnose and repair faults – a good omen for the future. The volunteers have introduced various ways of demonstrating the Baby story. They have produced a stand-alone PC display system that gives an interesting explanation of Baby in the developing history of computing. This has exploited their knowledge of what visitors are interested in and ask questions about. The system can be left on while they are away from the machine at lunch, for example. MOSI is recruiting more volunteers, and we have scope to offer coverage on other days purely in a “talk with power off” mode. This role will be suitable for demonstrators from non-computing backgrounds. As mentioned in my previous report, there have been very few component failures during 2014, very satisfactory bearing in mind that the machine is operational for about 18 hours per week. One of the Level 4 volunteers has been experimenting with using a 12” cathode ray tube (as used in the Accumulator store) instead of the 6” tube in the Monitor Display box of the machine. This would be non-authentic, but provides a much clearer view for visitors. We are contemplating whether and how we could legitimately take advantage of the idea. Finally, I am sad to have to report the passing of two members of the team which built the replica. Keith Wood designed the Central Control, and died on Boxing Day. Ken Turner designed the Vertical Deflection Store Addressing subsystem, and died on Friday 9th January. The 803 problem reported previously was simply a blown fuse, which was soon fixed. The power supply for the 903 extra store has been repaired, but currently some difficulty is being experienced with the 903 paper tape reader, at which I hope to take a look by the end of January. ◊ WORKSHOP, which turns a 903 computer into an interactive formula evaluator with similar power to BASIC, written by M.H. Beilby of the University of Birmingham. We have had copies both of the tape and of the manual which Elliotts issued for it in our archive for some time. ◊ The C & G COMPILER. An implementation of the Mnemonic Code for the City & Guilds 319 Certificate. Although I’d seen this in mentioned in 1960s Elliott publicity material, I’d never seen the tape until my visit to the Museum of Scotland last April, nor had I seen any specification. In June, Brian Spoor provided us with a copy of the City & Guilds 319 course specification, and subsequently Resurrection reader Chris Pugh-Jones has been able to provide a copy of the 903 binary tape. Oddly there were a few bytes missing at the start of the tape, but I’ve been able to work out what they must have been. So, for the last month, Andrew Herbert and I have been busily disassembling the tape, to reverse-engineer the operating instructions, which Andrew hopes to publish shortly. Our 1900 software specialists Bill and Brian have been assisting the 2966 project by examining some dumps from Maximop. We believe Maximop is supported under the CME manual operators’ executive, but we have encountered a problem whereby Maximop hangs after loading a PUC (program under control) on behalf of a terminal user. Brian has nearly completed work to produce a reverse engineered Maximop issue tape. I have contacted the Edinburgh museum collections centre with a view to arrange a visit to examine the 1900 items held there. After the milestone of running George 3 reached last November, we have been consolidating our progress. George is now routinely run on Saturday afternoons to host the adventure game on the 7501 terminal that is otherwise hooked up to the Raspberry Pi based emulator. Work has continued on the disc emulator software. Previously restricted to running with virtual disc images contained entirely in RAM, it is now operating under Linux with I/O to files on the micro SD card representing up to four virtual discs. This has enabled larger discs such as the FDS160 and FDS640 to be emulated, which will in turn allow a larger online George filestore to be established. Another 12V/8A power supply failed in the Device Control Unit (DCU). Fortunately repairs had just been completed on two of the previous failures so no downtime was incurred. 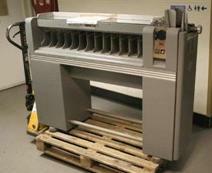 The lineprinter power supply has also been repaired and the printer is now back in operation. The main problem now is preventing George from using up all our paper stock with monitoring file listings! We have not yet heard anything from the manufacturer of the problematic air compressors used in the GTS decks, but we have had some success with another reconditioned unit. We suspect a temperature issue so it isn’t clear whether we might yet experience problems when the weather warms up again. An inadvertent tape write operation produced some smoke from the write driver board which needs to be investigated. We also had to exchange the main microprogram PCB. Although we now have the field engineering manual, we are on the look out for the accompanying board level schematic diagrams. The decks are of type Storage Technology (STC) 1960, if anybody is able to help. We have been working on one of the FDS640 drives. Alan has removed all the rotten foam and replaced all the air seals and the air filter, for which we fortunately have a number of unused spares. After clearing some problems with the power supplies we were able to spin up the drive for the first time. Although the heads remain locked at this stage, on the FDS640 they land on the surface and cannot be entirely withdrawn as is the case with the EDS80 exchangeables. Nothing too dramatic happened and the bearings seem to be ok, which was one of our major concerns. The focus of our efforts remains on securing the future running of our Argus 700 through the use of more ‘current’ SCSI discs. The Argus 700 can use certain models of SCSI disc that are formatted with 256 byte sectors so by current, we mean discs employing technology that is at least 20 years old. Later/modern SCSI discs were not designed to support 256 byte sectors, just 512 Byte sectors. As SCSI technology developed in the late 1980s, along with increased capacity, Ferranti modified their Argus 700 SCSI disc controller to work with these discs. The Ferranti Argus 700 SCSI disc controller for is the ME146X, the ‘X’ representing a 1Mb or 2Mb of on-board Store (RAM). The modifications to the ME146X were in the form of updated EPROMs for the on board Z80. The later EPROM versions supporting specific SCSI disc manufacturer/models were available on the market until the demise of Ferranti in 1993. To ensure we secure an operating future for the Bloodhound simulator with its Argus 700 we now need to obtain the latest ME146X EPROM version and also the corresponding version of Ferranti’s disc utilities. To this end we now have the support of a Ferranti Computer Systems design engineer who specialised in the Argus 700 disc systems who will take on the formatting and configuring of our SCSI discs. 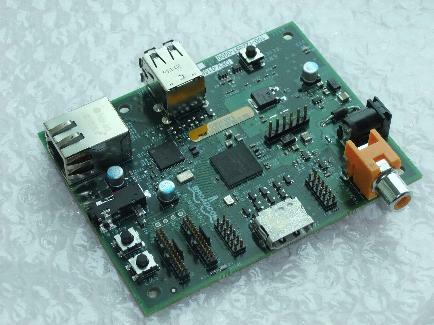 We are also being supported by a third party that will give us access to the latest ME146X EPROM version. It is hoped that by the next report there will be positive news on using SCSI discs on our Argus 700, the original Winchester on the Argus 700 having a FINCH interface. Other on-going work is to resolve what appears to be momentary mains drop outs in the computer rack. The suspect at the moment is a mains contactor. Some research carried out such problems with mains contactors revealed momentary drop outs to be a possibility. Sourcing and replacing the suspect contactor is now on the task list. The Society has its own Web site, which is located at www.computerconservationsociety.org. It contains news items, details of forthcoming events, and also electronic copies of all past issues of Resurrection, in both HTML and PDF formats, which can be downloaded for printing. We also have an FTP site at www.cs.man.ac.uk/CCS/Archive, where there is other material for downloading including simulators for historic machines. Please note that the latter URL is case-sensitive. The Our Computer Heritage website updates continue under the guidance of Simon Lavington and the revised site will be ready for pre-release viewing by mid February. Once agreed, the new site will support both the original mainframe systems and the new mini systems information sets collected by our volunteers and placed online for open access. There are seven computer manufacturers covered in the extension of OCH to British-designed minicomputers. For High Level Hardware Ltd. and GEC the entries are now complete. For Business Computers Ltd. and Information Computer Systems there is some tidying-up to do but the entries are nearly finished. For Computer Technology Ltd., Ferranti Ltd. and ICL significant work remains to be done but some progress has been made since the last report. The machine continues to run with reasonable reliability. One or two Dekatron anode resistors have been replaced. Some of the insulation tape which prevents U point connectors on the stores from touching the rack frames was replaced. It is not clear whether the machine needed this ‘fix’ from new at Harwell but it was certainly employed by Wolverhampton. An old problem with the “add and clear” order (2) completing without actually executing resurfaced briefly but went away again before we could get to the bottom of it. A sound artist is due to visit TNMoC at the end of January to record the sounds made by the machines, including of course the distinctive clicking of the HDC. The need is for the team to photograph and record the full state of repair of the machine before it is removed in August 2015. A list of suggested actions is now ready to be proposed to the Science Museum and a date to start this work agreed with them. The 401 Project is still suffering from association with the Pegasus Project and its risks with running a genuine first generation valve based computer. Various statements have been received about the potential future of this project but the Science Museum has still to confirm details. The 1301 project still awaits dates to deliver the rest of the system software items to Bilton Road store. We understand that the problem of the pallet racking installation which has hitherto blocked our access can now be solved as the 1301 team has made a donation to TNMoC to resolve this issue. PC software to allow the recovery of magnetic tape images has now been finalised and funding from donations in 2012 is now earmarked for this purpose. A team meeting planned for late February to mark the second anniversary of saving the machine will be used to discuss options of clearing the precious software on tapes and punched cards away from the homes of the team members who offered to hold the media. The decision to keep this media safe and not risk it to storage in the transport company’s warehouse was partly based on discussions with Carry Gently, the shipping company and also based on experience from safe storage in the operating days of these systems. Simon Lavington has been driving the Our Computer Heritage project forward for longer than he cares to remember. He opines that the time has now come for a fresh pair of eyes and a fresh set of fingers to take over. The idea would be to find a person (or persons) who could work alongside him for a while and then, if all goes well, take over the OCH project completely. Simon is keen to hear from anyone who can assist with the collection of historic material for the OCH website: www.ourcomputerheritage.org. If you would like to help, please contact him at . In 2008 Charles Bachman gave CCS a memorable lecture on his pioneering development of database systems in the early 1960s. 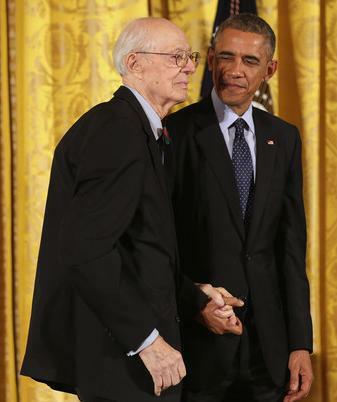 He has recently been awarded the National Medal of Technology and Innovation by President Barack Obama. The medals are the highest honours bestowed by the United States Government for achievements in science, technology, and innovation. Bachman is also a Distinguished BCS Fellow, a Fellow of the ACM and is a holder of the Turing Award. Auctioneers Bonhams have announced that in April they will be selling a “lost” notebook used by Alan Turing. Dating from 1942, the notebook contains Turing’s musings on matters mathematical though there does not appear to be any material relating to the Bombe. Turing’s papers were left to his friend the late Robin Gandy who presented most of them to Kings College Cambridge many years ago. However, this particular notebook was withheld because Gandy had used the remaining blank pages to make notes of his own some of which were of a personal nature. The notebook is expected to be sold for a figure approaching a million dollars. During restoration of Bletchley Park’s Hut 6, some WW2 working papers have been discovered in the ceiling space functioning as draft excluders. In particular some Banbury Sheets have been recovered. These were a form of punched card technology in which the alignment of holes between sheets was instrumental in message decoding. There are those who believe that history is cyclical, and that all this has been before. It’s a concept that, on the face of it, seems to fly in the face of logic, but every now and again you come across a topic that seems somewhat familiar. The story of Sir Clive Sinclair – then un-Knighted – and his entry into the home computing market is the stuff of legend. For those unfamiliar, the story goes thus: eager to escape the confines of his partnership with the National Enterprise Board at Sinclair Radionics, Uncle Clive sent his trusted aide Chris Curry off to helm a shell company dubbed Science of Cambridge. Sinclair didn’t really care what Curry did there, as long as he could get the company ticking over and ready for Sinclair to take over once he had convinced the NEB to cut its losses and run – thus giving Sinclair back the control he had lost of his eponymous Radionics company. In the BBC ‘docudrama’ covering these events, Micro Men, Sinclair is clear in his instructions to Curry: “There are some of those calculator chips down in the store,” he explains, “do help yourself to those.” The conversation itself was invented for the programme’s narrative, but the outcome was represented accurately. 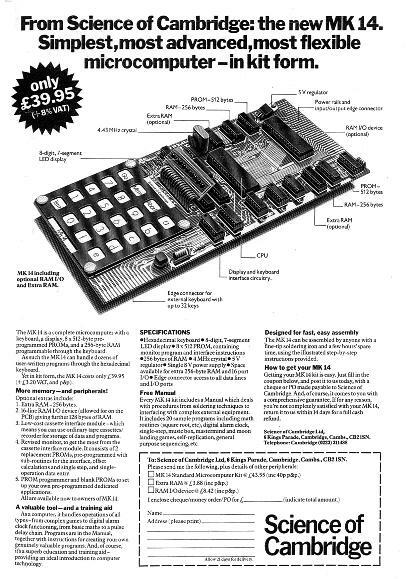 Since the Japanese had invaded the pocket calculator market in the UK with low-priced imports, Sinclair’s stock of chips had gone unused; Curry would take them and build the MK14 microcomputing kit, the success of which would convince Sinclair – without Curry, who would quit the company and found Acorn Computers with Hermann Hauser – to enter the home computing market with the sub-£100 ZX80 in the early 1980s. It’s a story known to many, and one which cannot help but spring to mind unbidden when learning of the origins of the Raspberry Pi. A single-board computer designed for educational use, the Pi owes its design – like the MK14 before it – to a warehouse filled with outdated chips for which few other uses could be found. Eben Upton, co-founder of the Raspberry Pi Foundation which is responsible for the development of the eponymous board, is a system-on-chip architect at US processor giant Broadcom. In his spare time, he had been working on the development of a sub-$30 single-board computer which he initially planned to build around a microcontroller from Atmel. By 2006, he had the first prototype in-hand: a battery-powered system built on Veroboard around an Atmel ATmega644, succeeded by a far more compact version constructed on a credit-card sized printed circuit board. The breakthrough came when Upton signed a deal with his employer to make use of the Broadcom BCM2835 system-on-chip processor. Like Sinclair’s calculator chips, the BCM2835 was a product past its shelf-life: its ARMv6 instruction set – developed, pleasingly, by Acorn Computers spin-off Acorn RISC Machines (ARM) in Cambridge – had been surpassed by ARMv7 while its single processor core ran at a sluggish 700MHz. The only real selling point of the chip was a powerful graphics processor and media codec, the result of its original target market being multimedia set-top boxes. Broadcom needed to find a use for its excess stock of BCM2835 chips, which its customers had long since stopped ordering; Upton needed an affordable system-on-chip processor to power his low-cost educational computer. The rest, as with the MK14 before it, is history. The Raspberry Pi Model B – so named in homage to the varying models of BBC Micro launched by Acorn Computers in the 1980s, another incidence of Jungian synchronicity between the two stories – launched in February 2012 after a considerable delay caused by design flaws and manufacturing defects. Initial hopes to sell a total of 2,500 units to hackers and tinkerers were abandoned by unexpected demand: retail partners Premier Farnell and RS Components saw their websites knocked offline due to the sheer volume of traffic generated minutes after the product went live. The first 10,000 boards were made in Taiwan and China, and found their way into users’ hands in March. While certain features (the BCM2835’s outdated processor architecture, the board’s limited 256MB memory, and its USB ports which proved to have only nodding acquaintance with the official standard) would limit the device’s usability in some scenarios, there was little doubting the launch had been a proven success. Using ports of the Debian GNU/Linux distribution, a Raspberry Pi user was free to use the device as a general-purpose computer – albeit slowly – while those more interested in interfacing with other hardware could make use of the general-purpose input-output (GPIO) pins located at the top-left of the board, a feature long since abandoned by mainstream computers. The initial Model B was followed by an updated revision which resolved a design flaw in the power circuitry and doubled the memory from 256MB to 512MB. The Model A followed, an even lower-cost variant which removed the Ethernet network port and cut the number of USB ports to one. Sales continued to mount: by May 2012 over 20,000 units had shipped, increasing to two million by the end of 2013 and three million in June 2014. 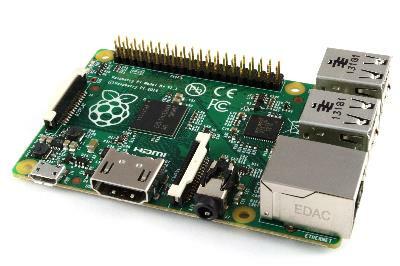 The Raspberry Pi Foundation didn’t rest on its laurels during this time: the Model A+ and Model B+ launched in 2014 with a more compact board design, significantly improved power supply circuitry, elongated GPIO header, and in the case of the latter an increased number of USB ports. The Compute Module rounded out the company’s offerings, packing the majority of Raspberry Pi features into a compact SODIMM module designed as a drop-in ‘brain’ for companies developing embedded systems. In all this time, however, the Foundation did not waver from its decision to use the Broadcom BCM2835. “The understanding that I have with Broadcom,” Upton told me during an interview in January 2012, “is that they are happy to continue providing chips for this project forever.” While supplies were guaranteed, rivals eager to carve off a slice of the burgeoning market had begun circling in the waters. To set one thing straight: the Raspberry Pi was not the first single-board computer on the market, as any student of computing history will know. Nor was it the first with an educational bent, nor even the first to feature an ARM-based processor, or the ability to run GNU/Linux. Devices like the BeagleBoard from CircuitCo – launched in 2008 with very similar specifications to 2012’s Raspberry Pi Model B – provided undoubted inspiration for Upton, but appealed largely to a niche market of technically-minded hobbyists. Coupled with pricing that sees the entry-level model sell for below £20 and the higher-end version for around £25, the Pi had a clear lead on its competition. Sales of 4.5 million for a device which arrives as a bare circuit board, lacking even a power supply or storage device and requiring the user to install their own operating system is nothing to be sniffed at. 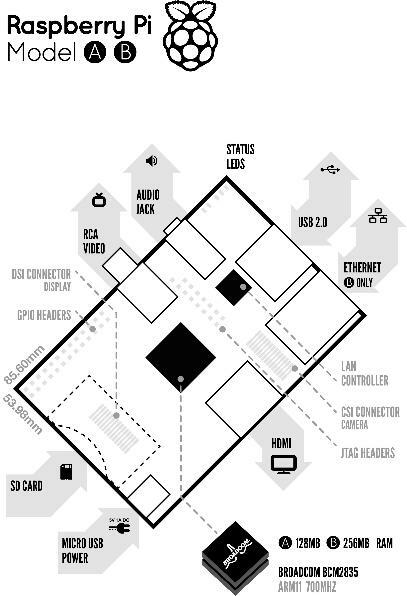 Rival boards – such as the Lemaker Banana Pi with its dual-core ARMv7 processor and SATA storage connectivity, or the SolidRun HummingBoard with user-replaceable computer-on-module (CoM) design for future-proofing – are beginning to make an impact, leading to the most recent product launch from the Foundation: the Raspberry Pi 2. While it’ll be a fair number of years yet before the Raspberry Pi becomes of interest to the computer historian and conservationist in and of itself, the board’s flexibility has already won it considerable support. Although lacking in performance compared to its rivals, the Pi has the clout required to emulate several simpler systems. Hobbyists have begun using them to resurrect older eight-bit computers whose electronics have long since passed the salvage stage, hiding the credit card sized system within the original casing of devices from the Sinclair Spectrum to the Acorn Electron. The further back one reaches into computing history, the more one finds a Pi can stand in for hardware long since decayed. 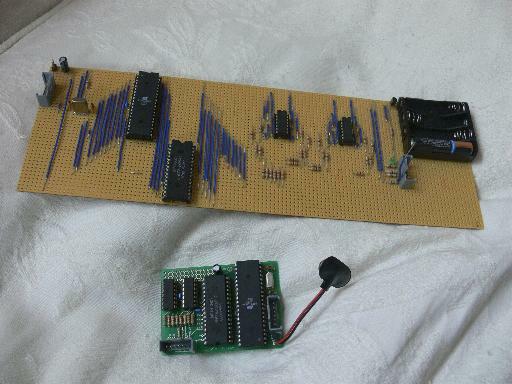 My friend Andrew Back of AB Open wrote a blog post for RS Components’ DesignSpark site of his project to emulate an IBM 4381 Intermediate System Processor, which was entirely successful. Others, rightfully embracing working with the real metal as a superior experience, have found the Pi useful for expanding the capabilities of older computing devices: Lon Seidman published details on using the Pi as modem device for an Apple IIe microcomputer, allowing it to connect to the Internet and act as a bulletin board system without needing to modify the original machine in any way, while Dave Schmenk’s Apple II Pi board allows a Raspberry Pi to be inserted into any Apple II or compatible as an add-on device. Gareth Halfacree is a freelance computer journalist best known for the Raspberry Pi User Guide. He can be contacted at . Being the report of one of several presentations given at the STFC Rutherford Appleton Laboratory (RAL) in November 2014 on the occasion of the 50th anniversary of the Chilton Atlas. Bob Hopgood, who played a major role in computing at Atlas and RAL from the early 1960s to the turn of the century, gave the first talk in which he faced the formidable challenge of covering this 41 year period in 30 minutes. In fact he started earlier than 1959 with a summary of the development of scientific computing in Britain from the mid-1950s when about 75% of all computing capacity available to scientists was owned by the UK Atomic Energy Authority. In 1961 AERE Harwell made the case for an extremely powerful machine and after much scientific and political debate it was decided that the machine would be a Ferranti Atlas, that it would be housed in a new laboratory outside the Harwell security fence and that its capacity would be shared between Harwell, universities and government organisations and the National Institute for Research in Nuclear Science (NIRNS) which would be responsible for the facility’s operation. Thus the Atlas Computer Laboratory came into being, its first Director being Jack Howlett. Bob described the machine’s architecture and parameters, noting that the UK could then claim to have the most powerful general purpose computer in the world and that the Atlas doubled the computational power available to the UK academic sector. Jack Howlett’s enlightened use of his discretionary powers as Director fostered new areas of scientific computation. A major, vital, early in-house development was of a Fortran compiler and, in addition, the Brooker-Morris Compiler Compiler was used to generate compilers to enable software written in other languages to be run on Atlas. Providing good graphical output, whether on paper, film or microfiche, was an early priority. This was done via a Stromberg Carlson SC4020. 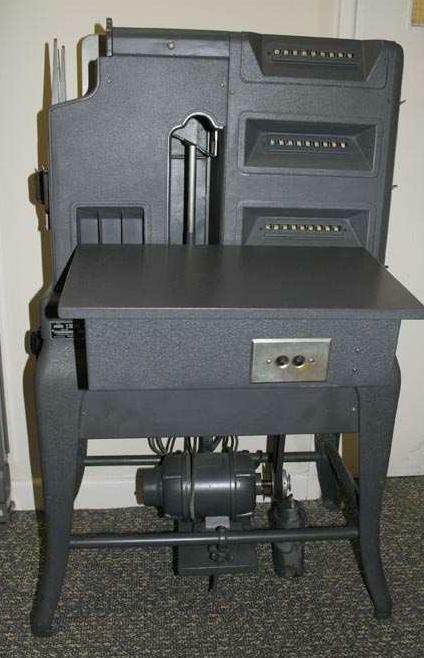 A microdensitometer service based on an Optronics P1000 scanner was introduced in 1974 serving 30 university groups working mainly on protein crystallography. 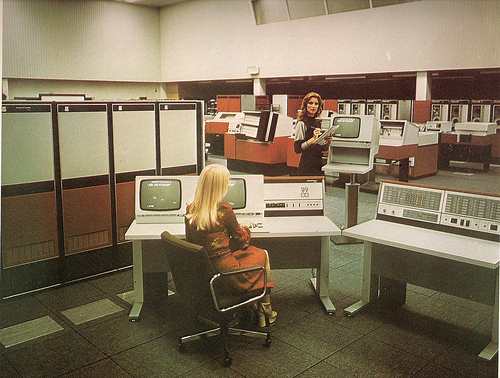 Interactive editing and job submission services were provided in the early 1970s through a Sigma 2 front-end computer which had independent access to a 16 Mword disc shared with the Atlas machine itself. The SC4020 was replaced in 1975 by an FR80 microfilm recorder which was the most versatile and most accurate of the recorders then available. As well as being able to produce output to paper and film it could produce high density microfiche, so that 400 pages of output could be contained on a single fiche. 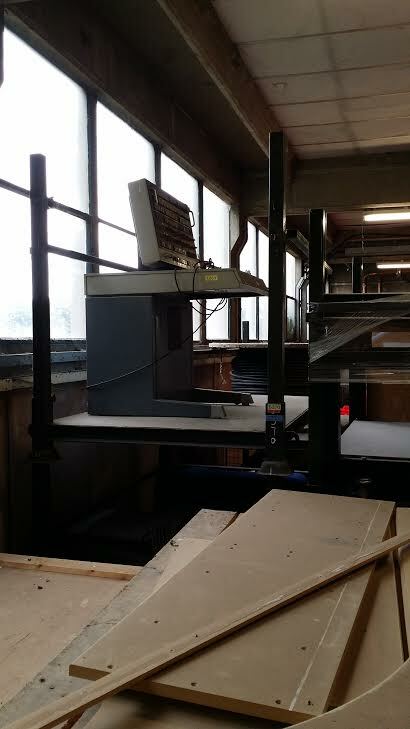 Its ability to produce colour output was unrivalled at the time and the FR80 was to continue in service until 1985 when its single-frame output functions were replaced by specialist printers, plotters and a microfiche recorder. The multiframe functions were replaced in 1990 by a facility that produced video rather than film, and a virtual reality facility was added in 1997. The main scientific disciplines using the Atlas were chemistry, physics, mathematics and theory and engineering. Projects included weather forecasting, satellite data processing, the development of a major quantum chemistry software suite ATMOL, X-Ray crystallography, modelling the strength of scaffold towers, M6 bridge construction, effluent in Southampton Water, and simulating hovertrains. The Atlas machine was closed down at the end of March 1973, having achieved 97% up-time and having processed 836,000 jobs. Some of the equipment survives – five bays of the machine are housed at the National Museum of Scotland (and the Atlas console was on show at the exhibition accompanying the Atlas@50 event). Considerable study and long negotiation went into possible successor machines. The eventual decision was to install an ICL 1906A and also to have access to 20% of the capacity of an IBM 360/195 that had recently been installed at RAL primarily for particle physics use. The ‘Atlas’ usage of the new facilities would be confined to SRC grant holders. 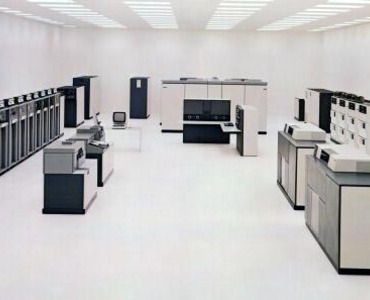 Prior to the 360/195, RAL had a Ferranti Orion followed by an IBM 360/75. In 1975 financial constraints within the SRC led to a decision to close the Atlas Laboratory as a standalone institute, and its staff resources were dispersed. Staff resources (but not in most cases, the actual people) to support SRC Science Board activities transferred to Daresbury Laboratory, where in the late 1970s a Cray-1 vector processing service would be introduced. RAL took on the management of the ICL 1906A and related services and 55 staff-years were transferred to SRC’s Engineering Board to set up a new Interactive Computing Facility (ICF) for university engineers. The ICL 1906A was eventually closed down in 1978. The IBM facilities at RAL were moved into the Atlas building which was renamed the Atlas Centre. The following years saw progressive expansion of the large scale machines at Atlas. 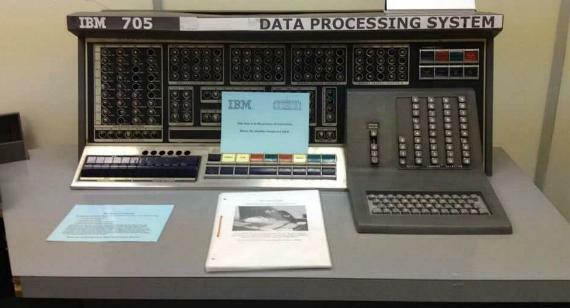 The IBM equipment went through many upgrades and replacements, driven mainly by the needs of experimental particle physics for data processing and monte carlo simulation, until by 1988 it had become an IBM 3090-200E with a vector facility. In the meantime the Engineering Board’s ICF was developing along the lines set out in a 1974 report on Engineering computing Requirements (the Rosenbrock report). The emphasis was on interactive computing, initially though enhancements to existing DEC 10 systems at Edinburgh and UMIST, installing Prime and GEC multiuser interactive systems at other universities and moving towards the provision of single user systems connected to local area networks through which they could access specialised facilities. Six special interest groups were set up to foster software developments and standards: artificial intelligence, digital and analogue circuit design, electromagnetics, finite elements, control engineering and computer aided architectural design. The first commercially available single user systems were PERQs, designed by Three Rivers Corporation and manufactured and sold to SERC by ICL, and running a version of Unix designed jointly by ICL and RAL. These were the first personal computers in the UK. Later over 200 Sun single user systems were distributed to university users, and superfast workstations supplied by Stardent and AMT were also assessed. When Atlas was first installed the transmission of input and output between the machine and its users was by physically transporting it by land or air. In the early 1970s radial networks began to appear from computer centres to their users and over the next decade a process of integration and standardisation took place which led eventually to the creation of the Joint Academic Network. One step along the way was the creation of SERCNet which brought together the separate RAL and Daresbury external communications systems, and had 186 computers attached by 1983. In 1977 there was a successful demonstrator project that linked for the first time SERCNet via UCL to ARPANET and other networks in the USA. 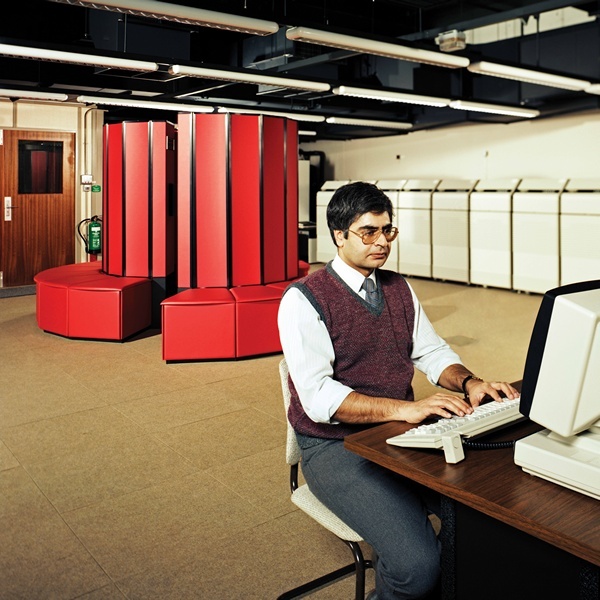 After the ICF programme came to an end the Laboratory managed and supported several SERC and DTI computing initiatives: Distributed Computing Systems (1977 – 1984), Engineering Support (1986 – 1995) the Alvey Programme (1983 – 1987) and the Transputer Initiative (1987 – 1992), all of which required RAL to support large numbers of projects across the UK academic engineering and computer science communities. Also, from the mid 1980s to the late 1990s, RAL played a leading role in a large number of ESPRIT projects in which SERC funding was enhanced by Esprit research funding. Returning to RAL’s large scale scientific computing activities, in 1985 the ABRC set up all-Research Councils Working Group to define future needs for high performance scientific computing. It recommended that a Cray X-MP/48 be installed at Chilton to be available to grant holders from all Research Councils. This machine was in service from 1987 to 1992, was replaced by a Cray Y-MP8128 which ran until 1996 to be replaced in turn by a Cray J-932 which ran until 1999. Also during this period IBM offered RAL a Joint Study Agreement whereby the company would upgrade the existing IBM 3090-200/1VF to a maximally configured 3090-600E/6VF (six processors each with a vector facility) and RAL would bring to the machine a set of numerically intensive prestigious projects from academics around the UK representing a wide variety of science and engineering applications and host a seminar at the end of the study on achievements that had been made. Disciplines benefitting from these machines included global atmospheric and oceanographic modelling, lattice gauge theory, fluid dynamics, material science, plasma physics, quantum chemistry, mechanical design and structural integrity, astronautics, astronomy, drug design and protein crystallography. By the early 1990s it was becoming possible to provide high performance computing facilities on powerful and relatively inexpensive modular systems. 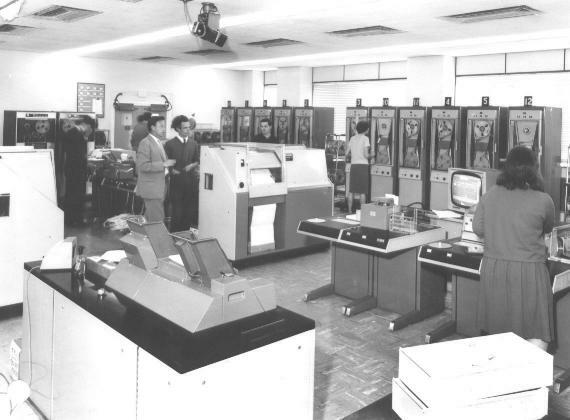 Processor farms for particle physics computing were soon providing much more computing capacity than had been available via mainframe technologies. Dedicated systems, initially using DEC equipment, provided for projects from other disciplines that required high performance but not necessarily at the level provided by national supercomputers. These included, in 1997, a Fujitsu VPP300, which had three of the most powerful vector processors then available, for use by NERC projects that needed high computational power concentrated in a small number of processors.. It was apparent from the early days of Atlas that storing, managing and providing access to large amounts of data would be an ongoing challenge. Initially the only available solutions were labour intensive: thousands of magnetic tapes being handled manually. Over the years more automated storage devices were installed such that, for example, by the mid 1990s an IBM 3494 linear tape robot system could house up to 20Tbytes of data. A major task in this period was to develop software systems that could provide access to the data store from different types of networked computers which was as future-proof as possible as technologies developed. In the 1990s there was considerable activity at RAL relating to ERCIM and to the development of the World Wide Web. ERCIM is the European Research Consortium for Informatics and Mathematics and was founded by laboratories in Germany, France and the Netherlands. RAL joined the organisation in 1990 and by 1994 there were a further seven members. In 1990 RAL had installed one of the world’s first web servers and was to participate in web standardisation activities through the activities of the World Wide Web Consortium (W3C). RAL provided graphics and XML support for the reference browser, Amaya and, with INRIA, ran ESPRIT projects to set up W3C national offices in Europe and to spread web awareness through the continent. ERCIM took over the running of the European Office of W3C in 2003 and Keith Jeffery, formerly of RAL, became President of ERCIM between 2007 and 2011. To conclude, Bob showed a graph of the Atlas/RAL computing capacity from 1964 to 1999 in Ferranti Orion units, based as far as possible on statements of actual (rather than peak) performance that were made at the times when new machines or upgrades were installed. It showed an end-to-end increase of 777,056 (Bob noted the lack of an error bar! ), and the growth trend was roughly consistent with Moore’s Law. This article was written by Brian Davies based on a presentation given by Bob Hopgood. The latter may be contacted at . The Atlas Computer Laboratory next to what is now STFC’s Rutherford Appleton Laboratory (RAL) in Chilton was built in the early 1960s to house the NIRNS (National Institute for Research into Nuclear Science) Atlas-1 computer. When Atlas was decommissioned in 1974 the console was put on display for many years in the building’s Reception Area. At some point it was moved to the Exhibition Centre at Rutherford Appleton Laboratory and was also displayed as part of Jack Howlett’s memorial celebration in September 1999. Later it was moved to RAL’s storage warehouse for safe-keeping. Do you remember the ending to the film Indiana Jones and the Raiders of the Lost Ark? The script describes a “Little Old Government Warehouseman” putting the Ark into a wooden crate. As the camera pulls back you see that this is one of the biggest rooms in the world, and it is full of identical wooden crates. I’m not suggesting that RAL really is the location of a top-secret government warehouse of course, but in the intervening decade I have looked several times for the Atlas console and the red panels of the Cray X-MP that was supposed to be in storage as well. Each time I came away disappointed, so sadly assumed that they must have been disposed-of years ago. Inspired by this find, I emailed an old photo of the Atlas console to the new manager of the warehouse and asked if he had something like that in storage. He was unsure, but his database contained an entry “Console” which was of the right vintage so we investigated further. The database described the location of the Console as “M2 B370”. The warehouse manager pointed this out, and for a second I had no idea what he was looking at. However, if you bent down a bit then peered back up between two mountains of crates towards the top of the racking you could just about make out the edge of something metallic and grey, with a handle and buttons on the front. We located a set of steps and, excitedly, I climbed up to get a better look. The Atlas console was there! After more than a decade, we had found it! 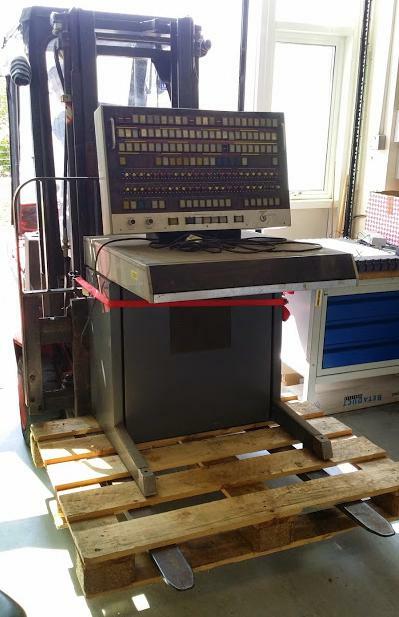 The Atlas console was retrieved and moved to one of our workshops. Following advice from the Science Museum, it was cleaned-up and the electrical modifications made in 1999 checked. We are seeking funding for further research and restoration, and are lobbying for a dedicated museum area on site to house not just these, but other items of historical interest and significance from 60 years of multi-disciplinary science research. Quite a number of people have been involved in the resurrection (may I use that word?) of the Atlas console. Most of them are considerably younger than it is. The console is very heavy; it took four men to lift it off the pallet. Some of the red and yellow plastic flip-switch end caps disintegrated in my fingers, but most survive. As you can see from the photo, the console had been stored immediately in front of a window in the warehouse, fortunately with its back to the light or the damage would have been extensive. The plastic button covers have yellowed as one would expect, and a few have been lost. One of the apprentices took-on the job of making replacement button covers, and reverse-engineered a tool with which to extract the bulbs behind the buttons so that they too could be sourced and replaced. An electrical engineer has been studying the MoD-standard wiring as part of his HNC project this year, making the console electrically safe, and programming a PLC to control the lights to give the effect of it processing. After several months of work, the Atlas console was finally put on display for the first time in 15 years at our “Atlas@50” event in November alongside the skeleton of the Cray X-MP, the console of an IBM 360/195, and other memorabilia from the Atlas era. A Cambridge engineering graduate, Hugh joined the Borehamwood Research Laboratories of Elliott Brothers (London) Ltd. in 1950, where he became involved with electronic magnetometers and analogue instrumentation. The Director of Elliott’s Computing Division, W S (Bill) Elliott, left Borehamwood in 1953 and Hugh followed him to Ferranti as a Sales and Applications Manager, working under Bernard Swann. 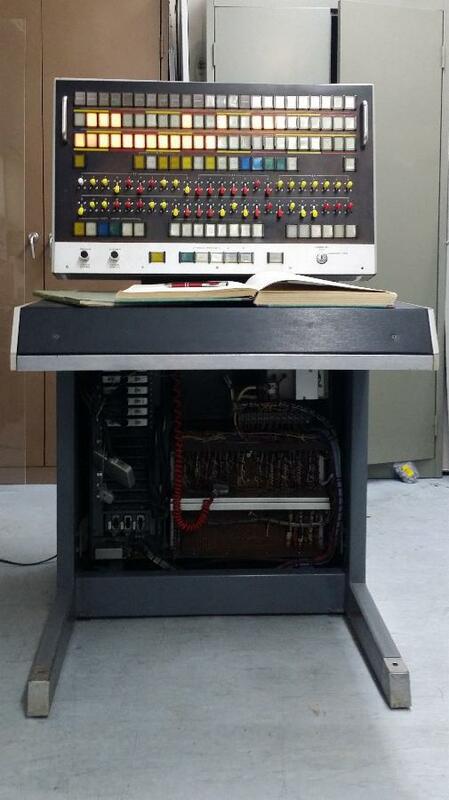 In 1956, the Ferranti Pegasus computer came onto the market and Hugh acquired a particular interest in this machine. By 1960, through his dealings with end-users, Hugh had become involved with character codes and data transmission. One particular development stimulated Hugh’s interest: the advent of Flexowriters with 7- and 8-track paper tape as replacements for 5-track teleprinters. At Ferranti, Hugh was a key contributor to the definition of 6-bit character codes for Orion and Atlas. It became clear that standardisation of character codes between computer manufacturers was highly desirable. Hugh took a leading role in various committees of the Electronic Engineering Association, the British Standards Institution and the European Computer Manufacturers Association. He became the UK delegate to the International Standards Organisation and the International Electrotechnical Commission. In about 1965 he promoted the character code ECMA-6 Ed.1 (later to become ISO 646) and he subsequently worked with Bob Bemer to achieve the transformation of ISO 646 by CCITT as International Alphabet No. 5, eventually known as ASCII. Hugh’s involvement in the development of coding standards continued for many years, progressing from 8-bit to 16-bit codes and embracing alphabetic and ideographic scripts for all languages of the world in regular use today, including some little-known minority alphabets in which Hugh became an authority. From 1984 Hugh was deeply involved in the development of ISO 10646 and, in 1993, became the first editor of the ISO 10646 Report. This, in due course, contributed to Unicode. In parallel with all of Hugh’s international activities, in 1964 Hugh joined STC as General Manager of the Data Systems Division. In 1968 he became an independent consultant, specialising in telecommunication-oriented computer systems, interactive computing and the representation of data. He retained these interests well into retirement, latterly combining them with computer history and writing books on Quaker topics. Hugh participated in the activities of CCS being a frequent contributor to Resurrection. His somewhat idiosyncratic views of computer history led, in 2012, to a book on Pegasus. ICL wins £4.5m deals for 2960s, 2970s: Two orders worth nearly £4.5 million for large 2900 systems are among the latest deals being finalised by ICL. One order, a dual mainframe configuration for the Sainsbury supermarket chain, is for the 2960 which is due for launching in the autumn. The other contract, due to be signed next month, is for three large 2970 configurations for Brandon Applied Systems, which the San Francisco-based consultancy is planning to use to establish a UK conversion service for existing ICL users. London meetings normally take place in the Fellows’ Library of the Science Museum, starting at 14:30. The entrance is in Exhibition Road, next to the exit from the tunnel from South Kensington Station, on the left as you come up the steps. For queries about London meetings please contact Kevin Murrell at or by post to 25 Comet Close, Ash Vale, Aldershot, Hants GU12 5SG. North West Group meetings take place in the Conference Centre at MOSI – the Museum of Science and Industry in Manchester – usually starting at 17:30; tea is served from 17:00. For queries about Manchester meetings please contact Gordon Adshead at . The Computer Conservation Society (CCS) is a co-operative venture between BCS, The Chartered Institute for IT; the Science Museum of London; and the Museum of Science and Industry (MOSI) in Manchester.